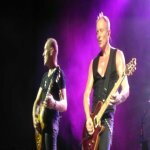 Def Leppard played a show at CMAC in Canandaigua, NY last night and the setlist details are available. The band played a 15 song set with Slash and his band (featuring Myles Kennedy and The Conspirators) as support. The show was another hot one played in almost 100 degree weather. 'Women' and 'Gods Of War' were dropped for this show due to the curfew of 11pm. The order of the show remained the same apart from these two changes. The show once again ended with the encore tracks 'Rock Of Ages' and 'Photograph'. The next Def Leppard show is not expected to take place until 2014. This and all 15 full songs played for the first time in this city. Played at a show for the first time ever without 'Gods Of War' also being played in the same set. Also played in only the third US city since 1988 alongside Las Vegas, NV (x11) and Gilford, NH (x1). Once again featuring a guitar solo by Vivian Campbell instead of Phil due to his hand injury.